Pepper, an Australian Cattle Dog, presented to Knutsford Vets late one April evening with excessive salivation that had first been noticed three hours before. In addition she held her neck outstretched and could not be tempted with food. Her family had recently relocated from down under and were very concerned that she may have been poisoned. Pepper had been on a walk with her grandparents earlier that day and was known to scavenge or eat things she shouldn’t when out and about. Like many dogs there were periods on the walk where she was out of sight and nothing particular was noted as a cause. On examination, Pepper was bright and alert but there was a lot of salivation. She presented palpation of her neck, there was some very subtle swelling in the area and her temperature was elevated. Oral exam was not possible as Pepper wouldn’t allow it. In-house blood tests showed Pepper’s organs to be working well, blood cells were present in the correct numbers and appeared normal. Pepper was sedated to examine her mouth and throat and Paul found a wound under her tongue. “The type of wound and the position was typical of a stick injury. A stick is thrown and the dog runs onto the end of it, mouth open and so it penetrates under the tongue, forcing the stick into the neck and sometimes even into the chest”. Retrievers, Labradors and Collies most commonly present with such problems, but vets see thousands of dogs every year with stick injuries. X-rays of the head and neck are important to identify where the stick penetrated, what structures may have been affected and if there is any foreign material remaining. However, wood is not a radio-dense material, which means that sometimes advanced 3D imaging such as CT or MR may be required to assess extensive wound injuries. Luckily in Pepper’s case, although the stick had penetrated 10cm into the soft tissues, no vital structures were damaged and the stick had come out of the wound in one piece. Under general anaesthetic, the area was copiously flushed to remove any debris and reduce the bacterial load. The wound was sutured closed and Pepper was able to go home that same evening with medications. 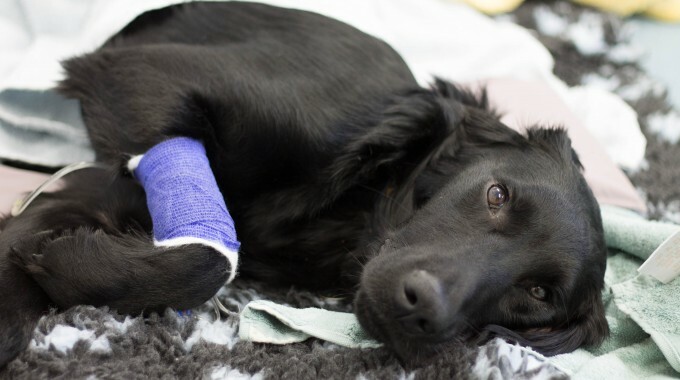 “Pepper had a very lucky escape and has made a full recovery with no complications but she is a good example of why owners should never throw sticks for their dogs but rather a ball or rubber toys that are not sharp.” Paul says. Knutsford Veterinary Surgery are proud to provide their own comprehensive emergency service in their modern and fully equipped practice at Fryer’s Nursery. For any advice during or outside of working hours, please ring 01565 337999.